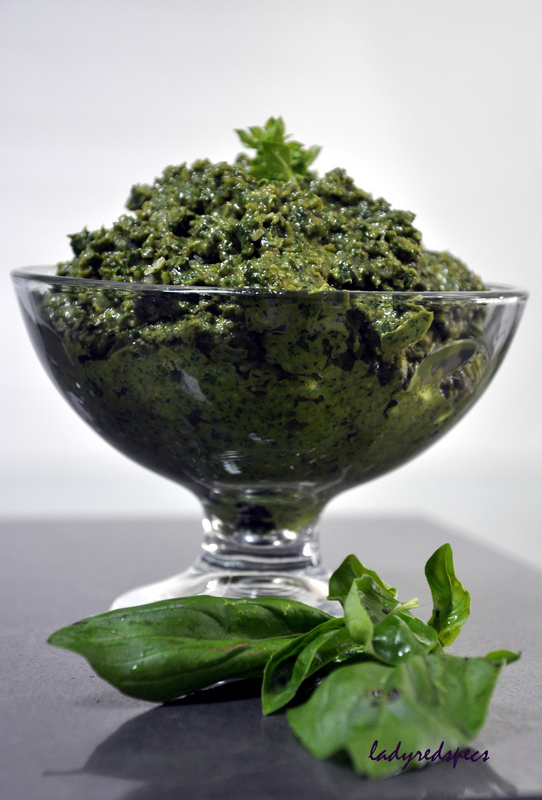 In my home town, the word “pesto” has been adopted by the food industry as the catchphrase that describes a chunky textured dip that is made from herbs or vegetables and nuts. There is coriander pesto with cashews and sundried tomato pesto also with cashews, but for pedantic purists like me it can only mean a delicious combination of fresh basil, garlic and pine nuts, best made toward the end of summer when the basil becomes a bit woody and its strength of flavour increases. Avoid hydrponically grown basil if possible, it is full of water which reduces the peppery flavour. Because the basil quickly oxidises with contact with the air it is important to move quickly and cover the surface of the pesto to be stored with a slick of olive oil. Fresh pesto freezes well to prolong its shelf life. The ways to enjoy pesto are endless. Pasta with pesto is its classic use, but I dress potato salad with pesto, I use it as a sandwich spread topped with sweet juicy tomato, I coat chicken strips with pesto before pan frying, I drizzle it on pizza and I enjoy a dollop in a bowl of minestrone. Making pesto is not an exact science, your palate should decide the amount of seasoning you use. Strip the basil leaves from their stems, wash thoroughly and dry well. (I use a salad spinner). Into the jug of your food processor, place the garlic and pine nuts, pulse until finely chopped. Add the basil leaves and again, process until finely chopped. With the motor running, pour the olive oil into the processor in a fine stream until you have added enough to create a whipped cream consistency. Transfer the basil mixture to a bowl, stir in the cheese, then season with salt and pepper to taste. Depending on the quality of the basil, a little lemon juice can make the difference between pesto that is OK and pesto that is great. Scrape the pesto into small lidded containers, pour a little olive oil over the surface to protect it from the air then either freeze or refrigerate. Bless Fae she’s a blogger’s matchmaker. Many of those I follow faithfully I have linked to via her blog! I use sweet basil to make pesto and have never tried it with tulsi, but, try it out, make a half batch, you have little to lose. I think there is a subtle flavour difference, but Iittle else to distinguish them other than the cultivar! I look forward to exploring your blog now and hearing about your pesto making success. I love traditional pesto, but I also love all the fun combinations! Thank you! Just the recipe I was looking for! A perfect pesto! My niece loves pesto and asked me to make her some (it’s for me too). 😀 ))) Fae. 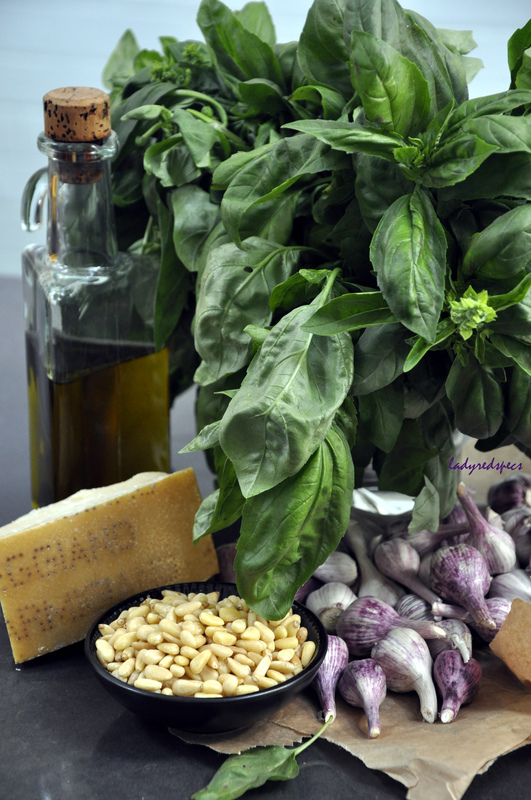 This entry was posted on March 5, 2013 by ladyredspecs in FODMAP diet, Food, Gluten Free, Light Savoury Dishes, Pasta, Sauces, Side Dishes & Salads and tagged basil, garlic, parmesan, pasta sauce, pesto, pine nuts.